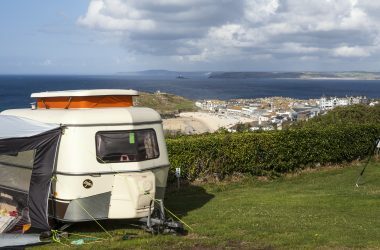 There’s nothing like a holiday under canvas, or in the comfort of your own caravan or camper. 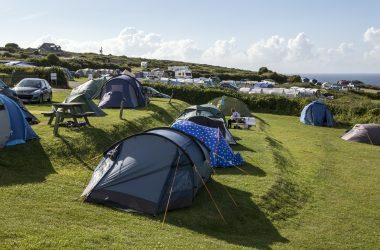 At Ayr, we have pitches for tents, motor-caravans and touring caravans. 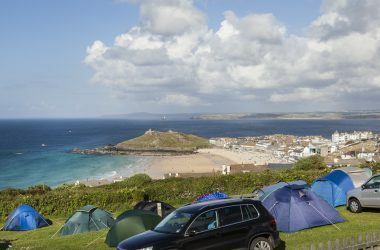 Most of the touring and camping pitches have stunning views across St Ives Bay and out over the sea. The site is naturally sloping; however, terracing keeps the pitches level, while ensuring that more guests have those fabulous outlooks. There are both hard-standing and grass pitches, and almost all of them have an electric hook-up (16 amp) and water. 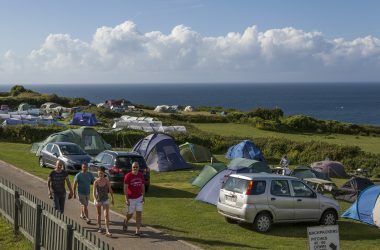 You are welcome to have a gazebo as well as your tent or caravan, provided it doesn’t encroach on your neighbours. Ayr’s facilities are outstanding. There is a modern shower block (with underfloor heating – after all, we are open all year), dishwashing and laundry rooms, and waste disposal points. Everything is maintained to a really high standard, and this is one of the reasons why our guests return year after year. Another reason of course is our excellent location. 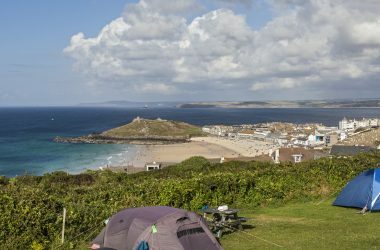 The only camp site actually in St Ives, it’s just a ten-minute walk to the beaches and town (you may prefer to catch the bus back up, which stops at the campsite entrance!). 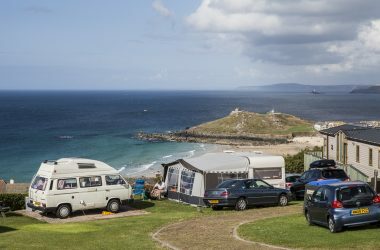 Once you’ve set up on your pitch, you won’t need to move your vehicle again if you don’t want to – a real holiday for the driver! With The Garrack Hotel next door, you have access to extra comforts, including a swimming pool and restaurant. It’s so easy to book your holiday at Ayr. If you have any questions at any stage, please don’t hesitate to call the Reception team on 01736 795855. Please call Reception and book over the phone. We will require a £ 75.00 deposit to secure a booking. The number is 01736 795855. We’ll send you a confirmation once the booking has been made. Please pay the balance when you arrive at Ayr. Please note: we can’t take bookings for pitches online.